Fannie Mae, the troubled US mortgage finance giant, has said that the $100 billion bailout it recieved from the US government may not be enough to keep it solvent. The company issued the warning after posting a $29 billion profit loss in its third financial quarter on Monday. The company said the government's money "may not be sufficient to keep us in solvent condition or from being placed into receivership" in its filing to the US securities and exchange commission. "If current trends in the housing and financial markets continue or worsen, and we have a significant net loss in the fourth quarter of 2008, we may have a negative net worth as of December 31, 2008," it added. The loss amounted to $13 per share, compared with a second-quarter loss of $2.3 billion loss, or $2.54 per share. 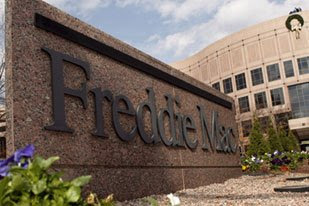 Both Fannie Mae and its sister mortgage titan, Freddie Mac, were seized by the US government on September 7 this year in a bid to avert a financial system meltdown from a credit crunch and housing slump. The two government-sponsored but shareholder-owned enterprises underpin about half of the US home-loans market. Both have been hit hard by the nation's slumping housing market - a crisis sparked by the sub-prime loans scandal, when people were granted mortgages they found they were unable to pay.